“The England Sevens squad had a five-week break to recover from last season, during which they had a total break from weights and could eat or drink what they liked. “The guys tend to come back a bit overweight and under-conditioned. Pre-season is the time to get them back into shape. They have to be able to recover completely, and live normal lives before getting back into a tough 11-month cycle. “Pre-season consists of six weeks of hard graft, a week off, and a warm-up tournament before the trip to Australia, but the first thing all players took part in was a profiling day. “We discuss previous injuries and identify any potential weaknesses and muscle imbalances. It involves podiatry, doing medical questionnaires, functional movements and core control exercises. “Early training involves low-intensity skills work, with the mileage and load increasing each week, controlled by GPS. “The boys work in pairs or positions in the gym. We do circuit-based sessions, weights to protect their joints in contact, and plyometric work to help build explosive power. “They do speed work at home, according to where we are in our training cycle. 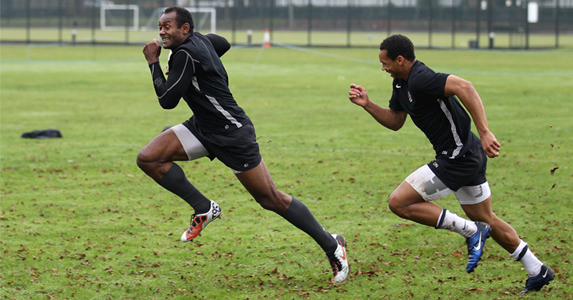 The aim is to move from a speed/endurance base towards shorter, faster sprint sessions. On the track, they might do eight 60m sprints at maximum intensity, or a rolling 5m followed by a 40m sprint. “Prehab exercises help strengthen bad ankles or shoulders, alleviate lower-back issues and correct muscle imbalances. We also included more contact sessions this year. This article appeared in the December 2011 issue of Rugby World Magazine. Find a newsagent that sells Rugby World in the UK. Or you may prefer the digital edition on your MAC, PC, or iPad. Would you like to sign up to Rugby World’s excellent weekly email newsletter? Click here.